Fermentation is a process in which microorganisms, in the absence of oxygen, generate energy by oxidizing carbohydrates and related compounds. It has been used since ancient times as an important method for preserving food. Vegetables, fruits, cereals, milk, and other raw materials have been treated in special ways in order to promote the growth of beneficial microorganisms while inhibiting the growth of deteriorating and pathogenic microorganisms. Fermentation will preserve the food, and it will also enhance the taste, aroma, texture, and nutritional value of the product. The preservation effect is the result of synthesis of lactic acid and heterofermentation—also, acetic acids and, some times, antimicrobial substances. Besides lowering the pH level, organic acids are also toxic for many microorganisms. It is also important that the fermentable carbohydrates are completely utilized by the fermenting microorganisms and thereby made unavailable for the undesirable microorganisms. In some products the addition of salt will increase the shelf life of the products by lowering the water activity. The natural habitats of lactic acid bacteria, yeast, and molds are most often plant materials. However, the type of organisms can vary considerably (1), depending on type of plant, climatic conditions, and available nutrients in the raw material. During some fermentations (e.g., fermentation of plant material such as cabbage, cucumbers, olives, soya beans, and coffee), several different types of microorganisms are required at the various stages of the fermentation process. In other fermentations (e.g., production of yogurt and beer), only a few different microorganisms are required. Figure 1 Micrograph of Lactococcus lactis subsp. lastis (original Streptococcus lactis) made by S. Orla-Jensen in 1919. (From Ref. 3:) Magnification: 1000x. starter cultures. 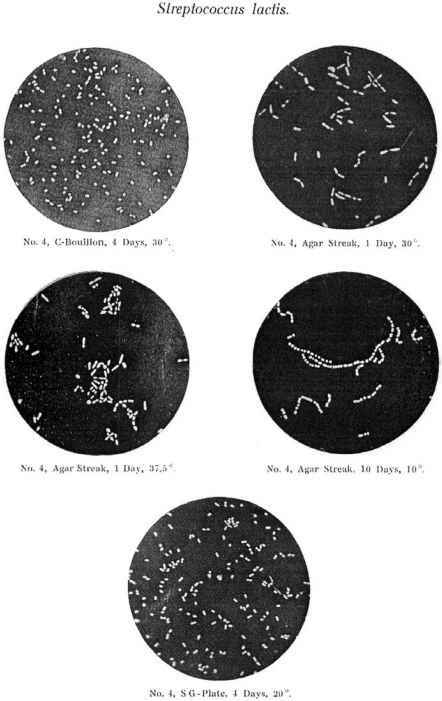 Most of the bacteria used for milk fermentations were named lactic acid bacteria (LAB) because they mainly produce lactic acid by their catabolism of the milk sugar (lactose); and because they were used to start or begin the fermentation, they were termed starters or starter cultures (6). A breakthrough in the history of wine occurred when Louis Pasteur described ''life without oxygen'' and of brewing fermentation when Emil Christian Hansen at Carlsberg brewery in the late 19th century isolated a pure yeast culture from single cells. For wine making, the concept of inoculating wine fermentations with pure yeast starter cultures was introduced by Muller-Thurgau in 1890, and in 1965 the first commercial dried starter cultures were produced for a large Californian winery (7). 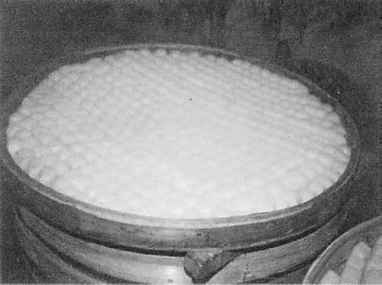 In 1920 the ''fed-batch'' process was introduced for the production of baker's yeast, and that resulted in a significant increase in the industrialized production of baker's yeast (8). The involvement of molds (mycelial fungi) in food fermentation goes back to the first records on blue and white molded cheeses. The first records for the production of well-known cheeses such as Gorgonzola and Roquefort date to 879 and 1070 respectively (8). Eventually, the cultures involved in the fermentation were purified and starter cultures are now commercially available for cheese and meat even though not developed to a great extent. Over the years, the concept of utilization of starter cultures for the production of fermented food, especially of bread, beer, fermented milk products, and cheeses, and for the production of sausages has gained increased attention. When was lactococcus lactis discovered?